Kuala Lumpur, 8 August 2018 – The 29th Macao International Fireworks Display Contest (“the Contest”) will be staged above the sea area overlooked by the Macau Tower on 1st, 8th, 15th and 24th September and 1st October. Ten pyrotechnic teams will present spectacular fireworks displays synchronized to music and laser lights within a multimedia experience not to miss. Aside from an array of outreach programs, the Fireworks Carnival will be held concurrently with the Contest to bring together culinary delights, lively performances and fun games. In sum, Macao Government Tourism Office (MGTO) has infused a palette of fascinating elements into five memorable fireworks evenings to present for residents and visitors. The Macao International Fireworks Display Contest is a major event organized by MGTO. Ten teams will present a wonderful fireworks show, featuring five different themes, namely “Magical Colours in Harmony”, “A Mystified Fireworks Dream”, “Shining Voices of Heaven”, “A Sparkling Mid-Autumn Night” and “National Day Fireworks Celebration”. The highly-anticipated lineup of the Contest promises wondrous spectaculars this year. In order of performance, the Contest pits ten teams from the Philippines, Korea, Japan, Belgium, France, Portugal, Germany, Austria, Italy and China against each other, among which the fireworks companies from Korea, Belgium, France and China will debut in Macao. All the contestants boast rich experience in creation of mega multimedia fireworks shows. Some of their portfolios also include fireworks displays tailored for major national celebrations in different countries and a range of accolades garnered from international fireworks contests across the world. MGTO and the General Union of Neighbors Association of Macau will jointly present the Fireworks Carnival next to the Macau Tower from 5 p.m. to 11 p.m. every fireworks evening. The Carnival will be a confluence of delicacies, performances and games, enriching the event with more fantastic experiences. The shoreline overlooked by the Macau Tower, Kun Iam Ecumenical Centre and Macao Science Center, the shoreline in Taipa, the top of Penha Hill as well as the leisure, cultural and creative landmark “Anim'Arte Nam Van” are among the popular vantage points for fireworks watching. Residents and visitors can enjoy every fireworks evening from their favorite angle and style. Four outreach programs will be held in tandem with the Macao International Fireworks Display Contest this year, including the Songwriting Contest newly launched to welcome the 30th edition of the Contest; the widely-popular Photo Contest, Student Drawing Contest and Trophy Design Contest. The outreach programs are sponsored by Wynn Resorts (Macau) S.A. The Macao International Fireworks Display Contest has developed into a major event and highlight of travel experience offered by Macao. In the days ahead, MGTO will continue to broaden the spectrum of spectacular events and leisure elements in Macao in collaboration with different sectors, making relentless efforts to breathe a new dynamic into the tourism industry in parallel with Macao’s transformation into a world centre of tourism and leisure. 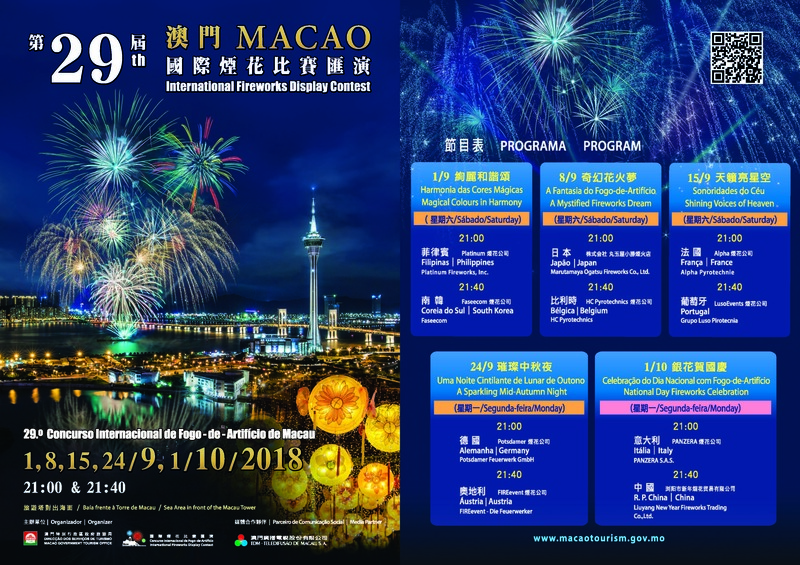 For more event details, please visit The 29th Macao International Fireworks Display Contest’s official website at http://fireworks.macaotourism.gov.mo or Macao Tourism Malaysia’s Facebook page at https://www.facebook.com/MacaoTourismMalaysia/.